Theosophical society is a religious movement founded in 1875 by Helena Petrovna Blavatsky, Harry Steel Olcott and William Q. Judge. The movement was among the first, which introduced Indian philosophy and religion to the West. Its teaching unites Indian key concepts, as for instance reincarnation and karma, the idea of spiritual masters (called avatars), who pass on insight and realization to humans, and finally Neoplatonic inspired ideas about, that the divine principle emanates in the world and in humans, and that Man can be a part of the divine through realization and insight. Theosophy is without comparison the religion, which has inspired most new religions and movements, as many hundred movements, in some shade, draw on fundamental ideas of Theosophy. The teaching of Theosophy is introduced in a number of books and magazines; the most important books are written by, or are ascribed Madame Blavatsky (for instance ”The Secret Doctrine”, ”Key to Theosophy”, ”The Voice of Silence”) and Annie Besant, Blavatsky´s successor as president (”Ancient Wisdom”). Another central person is Alice Bailey, whose thoughts about a new divine world order is one of the pillars in New Age. The teaching puts Man in the centre of its description of cosmos, because the final salvation, which shall bring unity with the divine, and which has consequences for both Man and cosmos, begins in Man and his growing spiritual realization and liberation. To achieve realization through a line of various stages of realization is the goal in Theosophy. Man is divided in three parts or levels: the body is at the bottom in the hierarchy, and the spirit is at the top. Between these two is the soul as a mediating factor. The spirit shall learn to control the body. Man (and cosmos) consists of 7 planes, of which the first three belong to the material world, while the rest belong to the spiritual world. The movement goes from the pure physical to pure spirit. Man is in his current condition caught in the matter and is tied to reincarnation, but can through development (evolution) work himself out of the current conditions and into a form of existence, which is characterized by pure spiritual being, unity with the divine principles. In this quest Man receives help from the spiritual masters in The Great White Brotherhood, a spiritual hierarchy of masters, whose insights, on various levels, are beneficial for Man in the evolutionary development. Spiritual seen, human beings have two complementary aspects: an energy aspect and a consciousness aspect. Seen from the energy aspect lawfulness rules: your body is subject to the physical laws of nature, your psychic system is subject to the lawfulness of the energy fields and of the energy transformations. The energy aspect is the area of compensatory karma; it is the area of experiences, the area of the personal and collective images of time, which work in sequences in past and future, and therefore in absence of awareness, or absence of consciousness. And that also means that it in itself is without realization. Seen from the consciousness aspect, then a human being seems to be akin to the wholeness, to be transcendent in relation to these lawfulnesses. The consciousness is the area of progressive karma, spiritual development; it is the area of realization, the area of the universal images of time, which work in synchronism with the Now. The Now seems to be a quality of awareness, and therefore also of consciousness and wholeness. Realization has to do with the three states the wholeness can be in: sleep, dream, awake. So it is only here you can talk about the spiritual insights of the great mystics. It is only here you can talk about genuine mystical experiences; that is: experiences, which are followed by realization (see my article What is karma?). In Theosophy everything is reduced to the energy aspect, though. And this reductionism is going again in other Theosophy-influenced directions (as for example New Age, Ufology, Ken Wilber, The Human Design System, The WingMakers Project - see my articles Six common traits of New Age that distort spirituality, A critique of Ken Wilber and his integral method, A critique of the Human Design System, and Time travel and the fascism of The WingMakers Project. This reductionism is due to the attempt of synthesizing spirituality and science. Theosophy is especially inspired by Darwinism, and its theories about human evolution (read more about reductionism in my article The pseudoscience of reductionism and the problem of mind). And the idea continues today in New Age and Ufology, where spirituality, apart from Darwinism, furthermore is sought synthesized with new developments within psychology, psychotherapy and natural science, especially biology and quantum mechanics. The problem of Theosophy is its attempt of synthesizing spirituality, consciousness, evolution and race. According to Theosophy all evolution is basically the evolution of consciousness. So, consciousness is reduced to evolution, or, the energy aspect of Man. According to Blavatsky´s writings, there will be seven root races assembled for our Earth; each root race is divided into seven sub-races. Only five root races have appeared so far. According to prominent occultist and Theosophist Charles Webster Leadbeater, a colony will be established in Baja California by the Theosophical Society under the guidance of The Great White Brotherhood in the 28th century for the intensive selective eugenic breeding of the sixth root race. A few million years in the future, the seventh root race will arise from the seventh sub-race of the sixth root race on the future continent that the sixth root race will be living on, and which will arise from the Pacific Ocean. It is believed by some Theosophists that after the present round of human spiritual evolution, by reincarnation of souls in root races, is completed dozen million years from now, the human race will migrate to the planet Mercury to continue its spiritual and physical evolution. 1) The one problem is the thought distortion called Truth by Authority. Truth by Authority is about taking statements to be true simply because an alleged authority (experts, teachers, states of enlightenment, divine sources, paranormal abilities, etc.) on the matter has said/justified that they are true. A level of critical thinking is always appropriate, because the statement may be based on magical thinking, false premises, faulty reasoning, wishful thinking or vested interests. People, who in their arguments/teachings, again and again, have to defer to some authority (experts, teachers, states of enlightenment, divine sources, paranormal abilities) in order to justify their arguments/teachings, are hundred procent on the wrong track, even if they should have some paranormal abilities. It is interesting to see, that true enlightened masters, as well as sober spiritual teachers, never do this. And interesting, that probably most of the many people, who have made a business of being clairvoyant/mediums/channelers etc., will fall for Truth by Authority (see my book A dictionary of thought distortions). 2) Another problem is, that spiritual seen, then nobody can tell you about your karmacially structures, or your spiritual evolution. All people, models or techniques - clairvoyants, channelers, regression therapists, shamans, Theosophy, Astrologers, prophets etc. etc. - who are claiming they can help you karmacial – that is: with your spiritual growth - are cognitional and ethical delusional and deceptive (read more about karma in my article What is karma?). As mentioned, then the genuine karmacially structures do not lie in the collective time, but in the universal time, which work in synchronism with the Now. If the karma idea is used spiritual seen correctly, then the focus, instead of being projected out in something afar (past lifes, a guru, birth, the future, Theosophy), will be present in something very near, namely only in the most intensive experiences of this actual life, and after that: in this actual Now with its possibility of realizing your innermost. So the universal images are lying as a kind of dream-tracks and song-lines in your actual life here and now. Only here and now they can be discovered. Only Man himself can find the progressive karma. The consciousness has the key in its life. It helps nothing, what people through a system may be able to think about the collective time, or fantasize about karmacially experiences and spiritual evolution. Many of these experiences (for example about past lifes) – and which have a certain reality for either the clairvoyant or the channeler – are collective fantasies. 3) The third problem is the problem of pseudohistory. Pseudohistory is purported history such as Afrocentrism, creationism, holocaust revisionism and the catastrophism of Immanuel Velikovsky. Pseudohistory should be distinguished from the ancient texts it is based on. The sagas, legends, myths and histories, which have been passed on orally or in written documents by ancient peoples are sometimes called pseudohistory. Some of it is pseudohistory, some of it is flawed history and some of isn´ t history at all. Pseudohistory should also be distinguished from historical fiction and fantasy. Anyone who cites a work of historical fiction as if it were a historical text is a practicing pseudohistorian. There are also writers of historical fiction who intentionally falsify and invent ancient history. A technique to do this is to claim to find an ancient document and publishing it in order to express one´ s own ideas. An example is The Celestine Prophecy, and The WingMakers story. A variation on this theme is to claim that one is channeling a book from some ancient being, e.g, The Urantia Book and Bringers of the Dawn (read more about channeling in my article Paranormal phenomena seen in connection with channeling). Before we go further it is important to mention, that evolutionism – also in its most modern Neodarwinistic version – is a natural historical report, and not a natural scientifical theory. Neodarwinism can – as all other historical science – only retrospective explain the development up to now in a rational way. This appears clearly from the fact, that it can´t give any scientifically well-founded prediction of the future development. It is not possible with any reasonable precision to predict the future biological development on the background of the theoretical foundation of evolutionism. As mentioned, then the reductionism of Theosophy is due to the attempt of synthesizing spirituality and science. Theosophy is especially inspired by Darwinism, and its theories about human evolution. And the idea continues today in New Age and Ufology, where spirituality, apart from Darwinism, furthermore is sought synthesized with new developments within psychology, psychotherapy, natural science, especially biology and quantum mechanics. The whole thing is presented as an ideology with a lot of attempts to predict the future evolution of Man, often connected with eugenics: the applied “science” or the bio-social movement (Social Darwinism) which advocates the use of practises aimed at improving the genetic composition of people, usually referring to human populations. So, the evolution of consciousness is in Theosophy reduced to seven root races, epochs, or stages, in the evolution of Man. And such a philosophy of consciousness ends in serious metaphysical problems of the mind, such as the free will problem, and the problem of personal identity, which are quite central, when you talk about spirituality (about the problem of personal identity and free will: see my article The pseudoscience of reductionism and the problem of mind). In Theosophy, the seven rays are said to be seven major types of Light-substance (spirit/matter) (waves/particles) that compose the created universes. These are also believed to convey “Divine Qualities”. We have already seen how Blavatsky uses the number seven in her classification of the seven root races as the seven stages of the evolution of consciousness; a classification, which is based on the theory of the seven rays. According to Alice Bailey, each person has a soul ray that remains the same through all their incarnations, and a personality ray that is different for each incarnation. Each ray is also correspondent with certain masters within the Great White Brotherhood, and with particular planets, cycles, nations, etc. The seven rays are the basis for what Alice Bailey called New Age Psychology – she divides everyone in the human race into these seven psychological types (read more about personality typing in my article Personality typing is a refined system of prejudice). Theosophy´s classification-system is harmful because it involves all the problems of what I call The Hermeneutics of Supicion (see my article The Hermeneutics of suspicion (the thought police of the self-help industry) and why I am an apostle of loafing). There is no evidence for such systems at all. How do we test these kinds of claims? We cant. In that way it ends in being a refined way of justifying prejudice. Using Theosophy´s classification-systems are simply a way of creating a system of prejudice. And that is anti-spiritual. In Blavatsky´s view, she was giving cold “scientific” facts (taught by what she called the “Occult Science”); a clear symptom of pseudoscience (about pseudoscience: see my article The pseudoscience of New Age and reductionism). In Alice Bailey the prejudices are getting even worse. Her vision of a unified society includes a global “spirit of religion” different from traditional religious forms and including the concept of the Age of Aquarius. A lot of controversy has arisen around some of Bailey´s statements on nationalism, American isolationism, Soviet totalitarianism, Fascism, Zionism, Nazism, race relations, Africans, Jews, and the religions of Judaism and Christianity. Yonassan Gershom and others have claimed that her writings contain racist material. Bailey described Jews as “the most reactionary and conservative race in the world”, etc., etc., etc. Later she stated that the Jews were themselves responsible for the bad tratment they received; that is: statements similar to the Law of Attraction devotees. So, there are clear fascistic elements in Theosophy. In that way we see, that Theosophy, and all its branches, is a central part of my concept of the Matrix Conspiracy (see my article The Matrix Conspiracy). When he was 13 years old the philosopher Krishnamurti (who was raised in Theosophical Society in India) became chosen to be channel for Maitreya, who, in the ideas of the Great White Brotherhood, is identified as Jesus, a spiritual master. 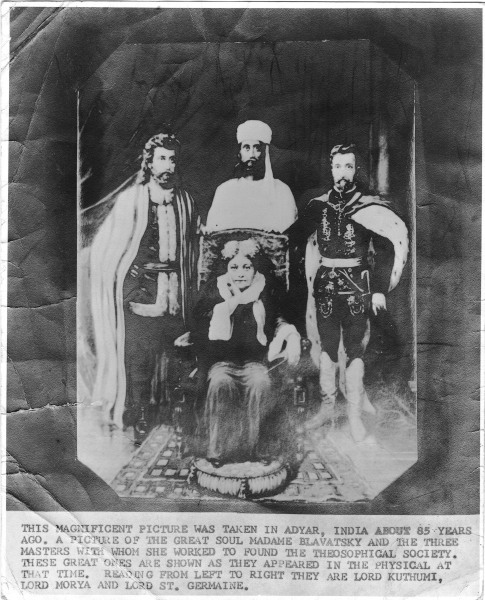 Annie Besant founded a theosophic wing on this purpose called “The Order of the Star in the East”, which Krishnamurti later dissolved. He did it on the paradoxical background, that he apparently himself entered into a process of enlightenment; that is: that he himself became a spiritual master, not a channel. The aim of part two of this article is in this way an investigation of the difference between a spiritual teaching, which is coming directly from an enlightened master, and the teaching which non-enlightened people are claiming to channel from enlightened masters. The aim is also to show his relevance for my own teaching, and for the new movement of philosophical counseling.